Athol, MA – The L.S. Starrett Company announced today, a new line of force measurement testing systems designed for high-volume production and demanding quality control applications. The Starrett® FMS Series is available in four capacities: 500N (112lbf), 1kN (225lbf), 2.5kN (560lbf) and 5kN (1125lbf). These innovative testing systems feature a rigid, single column frame design with advanced motion control with configurable speed rates from 0.001 to 50 in/min. (0.02 to 1270mm/min). FMS Series systems operate using the new Starrett L2 Series color, touchscreen controller with L2 Series force measurement software. The result is a turn-key system with superior performance and uncompromising capabilities. Like all Starrett products, FMS systems are easy to use and easier to maintain. The FMS Series systems let users perform basic force measurement tests or complex multi-stage tests according to international testing standards from ASTM, ISO,DIN and others- accurately, simply and efficiently. The FMS Series is ideal for testing everything from medical devices to packaging materials to springs and components. The systems include fill-in-the-blank test templates that let you setup standard test methods and perform testing in seconds. For more advanced testing, including multi-stage testing, the L2 Series software includes an innovative Test Builder application that lets the user create test recipes in a graphical, menu-driven manner. The software incorporates design queues from common personal electronic devices including PDAs, cell phones, etc. so that setup and operation are intuitive to the user. No programming experience is necessary. The systems feature I/O for interfacing to ancillary devices. The multi-touch, color controller features a 10-inch 1024×600 high resolution display. The controller is Wi-Fi® and Bluetooth® compatible with both Windows® and Android® operating systems. The controller’s dual USB 2.0 ports ensure efficient interfacing to printers, networks or computers with analysis and statistical software. Complementing the FMS Series are three types of load cell sensors, each with a measurement accuracy of better than 0.1% full scale and supplied with a calibration certificate traceable to NIST. Starrett offers sensors that are environmentally sealed; a “premium” style with a safe overload of 1000% of the rated capacity; and an “economy” style ideal for most general purpose applications. Sensors can also be calibrated on-site by authorized Starrett service professionals in accordance to ASTM E4 and ISO 7500-1 procedures. 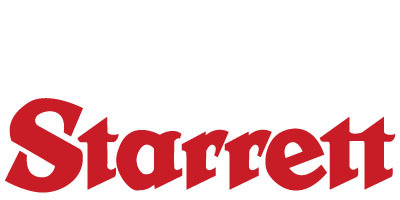 Starrett also supplies a full range of testing fixtures including platens, vise-action and wedge-action test fixtures, roller and scissor-style test fixtures, and pneumatically-actuated models for hands-free operation. All FMS Series force testing systems carry the CE mark and conform to relevant European standards.